Port city Juneau in Alaska. 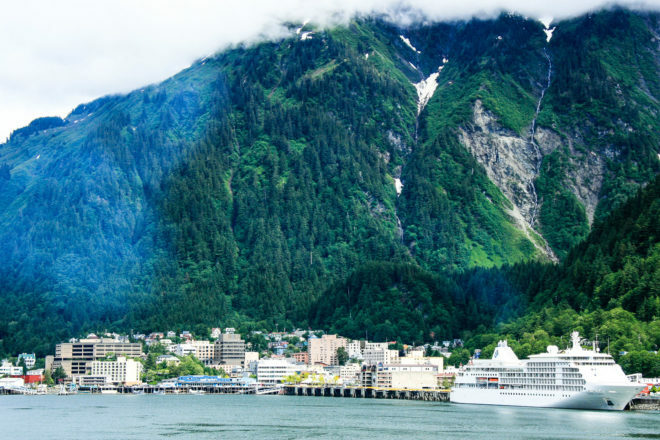 Must-see destinations to make the most of a seven-hour stop off in Juneau, Alaska. • While the Alaska State Library is currently closed – reopening in 2016 as the State Library, Archives and Museum – visit the quirky Last Chance Mining Museum, which celebrates the mining history of the area. • Take a picture of a totem pole; they are peppered all over the city. • Mendenhall Glacier is located 20 kilometres out of town so this is probably going to take up all of your time if you have only one day in port, but it is apparently well worth the time and effort, rewarding visitors with copious stunning vistas and ample fresh air; book a tour to get the most out of it. • Juneau Arts and Culture Centre is filled with works by local artists, with the lobby shop selling pieces to take home with you. • Bear watching is another activity that is going to take up most of your time, but what more do you need to see when you’ve been up close to brown bears in the wild?